Identification: Moyle (1976a); Eschmeyer et al. (1983). Native Range: Marine. Coast of California from Tomales Bay in the north to the Gulf of California in the south (Eschmeyer et al. 1983). 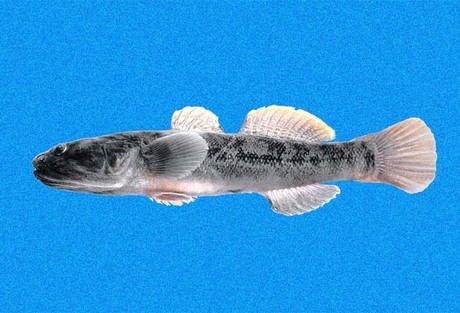 Nonindigenous Occurrences: This species has been reported from Roosevelt Lake on the Salt River in Arizona (Minckley 1973), and the Salton Sea of California (Barlow 1961; Walker et al. 1961; Moyle 1976a). It was probably introduced into the lower Colorado River in Arizona-California-Nevada, where it is/was commonly used as a bait minnow (Miller 1952; Minckley 1973; Minckley, personal communication). Table 1. States with nonindigenous occurrences, the earliest and latest observations in each state, and the tally and names of HUCs with observations†. Names and dates are hyperlinked to their relevant specimen records. The list of references for all nonindigenous occurrences of Gillichthys mirabilis are found here. Means of Introduction: The longjaw mudsucker seen in Arizona was probably a bait bucket release. This species is used as bait in central Arizona and in the lower Colorado River (Miller 1952; Minckley 1973). Five hundred fish obtained from San Diego Bay were intentionally stocked into the Salton Sea by the California Department of Fish and Game in 1930 (Barlow 1961). Hubbs (personal communication in Barlow 1961) suggested that some G. mirabilis may have been introduced into the Salton Sea by live-bait dealers. However, Barlow (1961) considered existing Salton Sea populations to be derived from the San Diego planting. Status: Established in California. Established in lower Salt Creek near the Salton Sea (Swift 1993). The species as presumably failed in the Salt River in Arizona as no recent specimens or mention of this were found by us. Impact of Introduction: In Salt Creek, this introduced species preys on the endangered desert pupfish, contributing to it's population decline in that drainage (Martin and Saiki 2009). Remarks: The longjaw mudsucker is a popular bait fish that can live out of water for six to eight days if kept moist (Eschmeyer et al. 1983), can withstand being hooked, can tolerate freshwater, but cannot reproduce in freshwater (Barlow and De Vlaming 1972). Evans and Douglas (1950) reported collections of several specimens, identified by Carl Hubbs as Gillichthys destrusus, from the Salton Sea in 1949. Barlow (1961) treated that species as a synonym of G. mirabilis. Although Swift (1993) says this species is established in the lower Colorado River, this location was not mentioned by Moyle (2002). Minckley and Marsh (2009) and museum specimens from FishNet2 depict the lower Colorado River occurrences near the mouth of the river. These are south of the U.S. border (which is why Moyle didn't include them) and would be native locations. Barlow, G. W. 1961. Gobies of the genus Gillichthys with comments on the sensory canals as a taxonomic tool. Copeia 1961(4):423-437. Barlow, G. W., and V. L. De Vlaming. 1972. Ovarian cycling in longjaw gobies, Gillichthys mirabilis, from the Salton Sea. California Fish and Game 58(1):50-57. Eschmeyer, W. N., E. S. Herald, and H. Hamann. 1983. A field guide to Pacific Coast fishes of North America. Peterson Field Guide Series. Houghton Mifflin Co., Boston, MA. Evans, W. A., and P. A. Douglas. 1950. Notes on fishes recently introduced into southern California. California Fish and Game 36:435-436. Martin, B.A. and M.K. Saiki. 2009. Trophic relationships of small nonnative fishes in a natural creek and several agricultural drains flowing into the Salton Sea, and their potential effects on the endangered desert pupfish. The Southwestern Naturalist 54(2): 156-165. Walker, B. W., R. R. Whitney, and G. W. Barlow. 1961. Fishes of the Salton Sea. Pages 77-92 in B. W. Walker, editor. The ecology of the Salton Sea, California, in relation to the sport fishery of California. Department of Fish and Game Fish Bulletin 113.